We all have our idea of what would constitute a dream concert, and if you were a British teen in 1965—or an adult in 2016 who happens to know where to find a good time machine—yours might go something like this: First, you’d book the Rolling Stones as one of your opening acts, performing some rhythm and blues favorites like Otis Redding’s “Pain in My Heart” and Solomon Burke’s “Everybody Needs Somebody to Love.” You’d also invite some of the currently happening bands like the Moody Blues, the soulful Georgie Fame and the Blue Flames and Herman’s Hermits. For the second half of your fantasy concert, you’d get serious, bringing on the heavyweights: the Searchers, Them (featuring that dynamic singer Van Morrison) and the Animals, along with a couple of the best solo artists the U.K. has to offer: Dusty Springfield and the young folk singer from Scotland, Donovan. Well, if you were at London’s Wembley Empire Pool on April 11, 1965, you wouldn’t have to dream; you could have witnessed that very concert, filled out with other current faves like Cilla Black, Freddie and the Dreamers, folk-rockers the Seekers, Wayne Fontana and the Mindbenders, and more. Each year, beginning in 1953, the British music weekly NME (New Musical Express) polled its readers on the best of the year. The winners were then invited to perform for the people and, at the height of the British Invasion, that meant the Beatles, Stones, Animals, Kinks, etc. You might think that a concert featuring so many future classic rock acts would last for a week, but in those days it was all about running on stage, playing a few hits and beating a hasty retreat. The entire show—presented here in black and white, of course—took about two hours from start to finish. 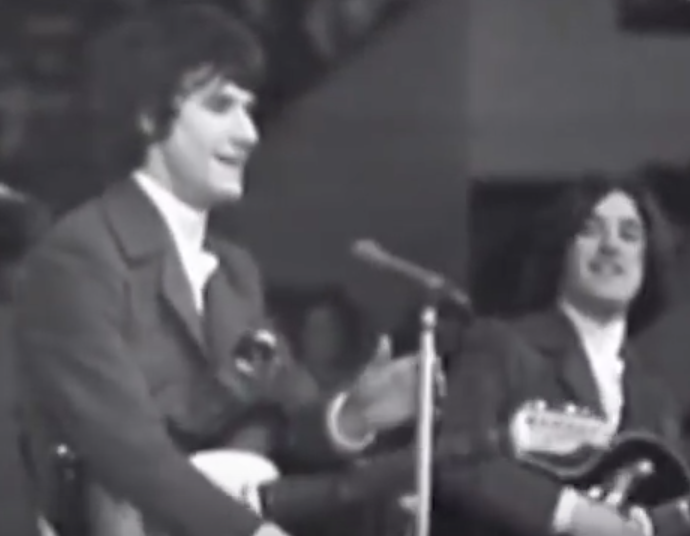 Our Classic Video also includes live performances of the Moody Blues’ “Go Now,” Herman’s Hermits’ “Mrs. Brown You’ve Got a Lovely Daughter,” the Stones’ “The Last Time,” Donovan’s “Catch the Wind” and Them’s “Here Comes the Night.” Whew! So many of the acts that played at this event are still performing today: 100s of classic rock tour listings. Wow! This really is a time machine! Great seeing all the hit-makers from 1965. Although the modern video gimmickery is a bit distracting, the sound is surprisingly good. THANK YOU. Brings joyous tears to my eyes as I listen and go back in time.